One of the great points made in the Yaseru Obento Recipe  book is that just because your bento box is small and fits the guidelines for selecting the right size bento box , it doesn’t mean you can fill it with anything. I thought I’d illustrate that with two bentos which use chicken as the main protein. 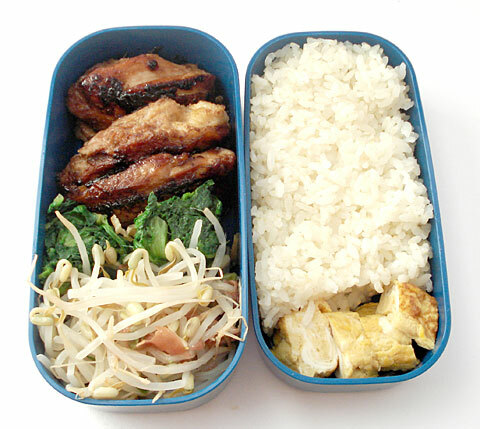 In the photo above, the two leftside containers make up one bento, and the two rightside ones another. They are both Lube Sheep brand two-tier bento boxes, which I think a lot of people have since they are nice and compactand quite inexpensive. The nominal capacity for the two compartments combined is about 500ml. 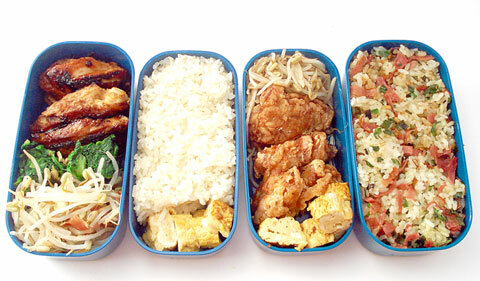 The two bentos may look pretty comparable, but calorie wise there’s a big difference. Let’s see how I filled the right side bento first. How did I manage to pack in so many calories in such a small space? First of all, I used oil for all four elements - deep-frying the chicken with the skin on, and sautéing and frying the bean sprouts and rice. I was fairly liberal, but not as liberal as a typical takeout restaurant might be, with the oil. I also packed the rice into the slightly larger compartment as tightly as I could. Now let’s look at the other bento. What did I do differently? The chicken is cooked, with the skin still on, in a non-stick frying pan with no added oil. (You could save more calories by taking the skin off, but I do like that crispy caramelized skin.) The rice is plain, which is fine since the chicken and tamagoyaki are well seasoned. I also packed it into the slightly smaller compartment, and left space to put in the tamagoyaki (which is the one element that is identical between the two bentos). And the vegetables are blanched, so no oil is added. Watch the cooking methods you’re using. If you are craving something deep-fried like katsu or karaage, by all means use it - but compensate for it with the other things you put in your bento. Try the dry- or water-sautéing method that I’ve described in previous bentos (like this fried rice bento ) that use just a little oil for flavor. Use lots of low-cal vegetables. Try to fill in as much space as you can with vegetables that you’ve cooked using as little added oil as possible - steamed, blanched or boiled, stewed or dry-sautéed. These points are important to remember if you are using bento lunches to aid in weight loss, but even if you aren’t they should be kept in mind if you want your carefully prepared lunch to have the maximum health benefits. 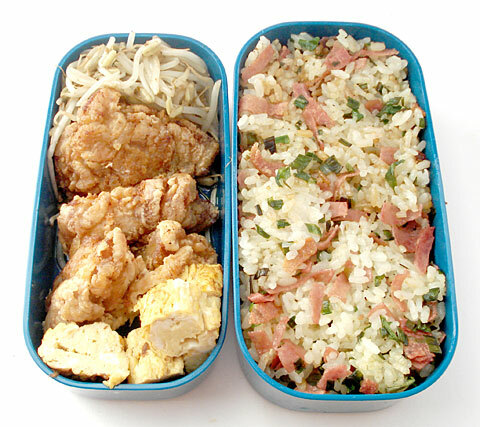 I’ll do a step-by-step of the lower-calorie bento in another post. I think I’ll skip the high-calorie one though!